You can be wrong 50% of the time and still make loads money! Trading stocks, options, forex, commodities, indices and/or CFDs. Day trading, position trading, swing trading - it doesn't matter! A beginner, intermediate or fully experienced trader. In this course you'll discover specific step-by-step trading money management strategies, used by successful traders, that you can literally drop into your current trading system and see immediate profit increasing results. The 3 critical risk management components that your trading system must have - without just one of these components you're guaranteed to fail. Step-by-step instructions on how to turn your current trading system into a cash generating machine. It's easy to discover your trading edge, once you know how. How to strategically minimize losing trades and eliminate big losses. The fine art of letting your profits run. Are you selling your positions too early or are you holding on too long? Are the risks you are taking guaranteed to send you broke? Discover the golden formula that calculates your position sizes for you and guarantees you stay in the game. How to calculate your worst case scenario even before you enter a trade. This is guaranteed to make it easier to sleep at night. The secret to managing open positions - you too can learn this disciplined approach usually reserved only for professional traders. The ideal amount of money you should trade with. No more guess work! The single best way to calculate your stop loss and save big $$$. Without knowing this method you're flushing money down the toilet. The one ingredient you literally Drop into your trading system that can triple your profit! - you'll want to know what that one is. TSR 2.0 is completely revised, tested and proven with hundreds of traders worldwide (see the testimonials below). Only $97, click here for instant download. To ensure you've 'got it'... I've also put together a fantastic 'test yourself' workbook that makes the perfect compliment to the TSR 2.0 manual. Includes live trading money management examples, from start to finish, with complete working calculations. 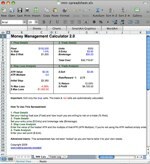 My own personal money management wizard spreadsheet with all the money management formulas already programmed in for you. All you have to do is fill in the blanks. Now it's dead easy to apply the theory. For over four and a half years, a group of 14 commodity traders earned an average annual compound rate of return of 80%. Famously known as the turtle traders, with this bonus, you'll get their precise trading rules. Curtis M. Faith, one of the original turtles said "These are the actual rules that I used in my own trading." Listen to a 45 minute presentation by Stuart McPhee, author of "Trading In A Nutshell", with his take on the the critical components of money management. Buy it. Use it. Profit from it! No Questions Money Back Guarantee. Grab your copy of TSR2.0, test it out and if you're not happy for any reason, within 60 days, simply let me know and I'll refund your purchase 100%. I can't be fairer than that. These are not theoretical strategies that only super-traders can profit from. They are powerful tactics you will be able to understand and put into practice. Order now and I guarantee youll be thrilled. Any Questions? Click here to email me. These are the secrets top traders use, because I use them too! "Trading Secrets Revealed from David Jenyns is really the first practical training course we've seen that simplifies the most important aspect of trading. I know these are the secrets top traders use, because I use them too! As we all know, knowledge is the Golden Key to trading success and this is filled with some of the best trading information I've seen. What I enjoyed most was the fact that this course isn’t just theory, David explains how to apply these principles to your personal trading system. So it’s ideal for every trader. Again, Great job!! Thank you so much for your indispensable course?" "I just thought I would drop you a line and let you know how impressed I am with your "Trading Secrets Revealed" course. It's not often that I get excited about new products after so many years but yours is really something special. Highly recommended for traders at any level. Well done"
This is solid material. It can indeed be called the Holy Grail of trading. "This is solid material. It can indeed be called the Holy Grail of trading. The elements of this course is the common denominator of all successful traders, whether the trader daytrades, swing trades or holds for a longer term. Having traded for a while I know that for most traders the contents of this course is usually hard earned over months or years. It'll definitely point the rookie in the right direction and crystallize for us veterans what we may know instinctively. While this course may not guarantee your success, without the elements of this course one is doomed to failure. I wish I had this course when I first started. Lastly, you have David, the author, who seems genuinely eager to help. The few times that I corresponded with him he answered eager to help with any problems. The entire package is a winner well worth the investment." "David Jenyns has really captured what we feel is the most important and most overlooked aspect of trading, which is trading money management. So many traders base decisions on emotions and not a solid plan. This e-book gives great examples of how to use stop loss orders to minimize losses and trailing stop loss orders to allow profits to run. This is the key to successful trading. You can be wrong 50% of the time and still make money with this system!!! Highly recommended". I wanted to let you know that since I read your material in early May, I have implemented several items, including limiting my loss to 2% of float and using your initial and trailing stops, into my own trading system. As a result I definitely have more confidence and less stress about my trades. Enough of my May and early June trades have now stopped out so that I can make a decision on the success or failure of implementing these items I have learned from you I am happy to report that my portfolio in June grew 49%. Thank for your help and keep up the great work." "What really sells your product is how concisely you state what so many books take chapters to state. " "It will help me to focus on what is important in my journey to become a professional trader and as such I found it very timely." "These are the essentials. Without them, you shouldn’t even think about trading?" "It has certainly clarified my understanding of principles that I knew a little of, but not enough, about." "Hi David, I bought the course and have found it very enlightening. It's amazing how something so simple can spell the difference between prosper and ruin. The way you explain the concept is very clear and concise." I purchased TSR2.0 on Thursday (March 28) and have reviewed the manual. I think that you have done an outstanding job of presenting the concepts of Money Management in a simple manner. I would highly recommend the course material for beginners and existing traders whose money management is weak. " I thought the updated version to be an even more valuable asset to any trader, and the first version was very good. Many of the costly errors made by most in the first few years of trading can be avoided by following the excellent advice set out in the package. The money management advice can keep the unwary trading where they may have lost their float without it and given up. There�s sound advice in sticking to a system you have faith in; without which you can be a random investor with the odds stacked against you. The logic in having solid investment aims in a trade can be clearly seen, and the importance of Stops is made clear. Is the package worth the cost? Well I would say that many times its cost could be recouped in avoiding one bad trade if all the strategies, or even just some, are incorporated into your trading technique. I wish when I was going through the package that I didn�t have to keep saying to myself, �I have done that wrong, and that, and that ��. " Thank you very much for the updated version of TSR. I can tell you after revise the updated TSR version that this new document is even much better than the previous one. What I really like about this eBook is that it contains essential information about money management in the trading markets. All the information is clearly explained in a very easy way to be understood. 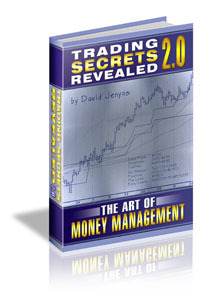 "David Jenyn's "Trading Secrets Revealed 2.0, The Art of Money Management" is a welcome report on the often slighted topic of money management. It provides detailed examples for the newcomer and useful reminders for the seasoned trader. I especially liked the extensive examples and questions and answers booklet. " I have just read your TSR 2 and am giving some feedback for you. I think the information in there is great, I know that people actually ignore so many things about themselves and how much money management helps. It took me years to actually look at myself an only then did things start to look up for me. I hope people read and take the valuble information you give them and use it. It is well worth the investment. I have just finished reading tsr2 and found it to be a very clear and concise book on many of the subjects that need to be covered and memorised by the trader, both old and new. It also has many great examples to make sure that the points covered have been completely understood. "TSR2 was all I expected. Having had considerable exposure to your previous 'works', and knowing how valuable they were to me, I had every expectation that this latest compilation would be fantastic - and it is. Layout, formatting, wordsmithing, use of diagram, etc etc all perfect. More importantly, the content is superb. Any person looking to trade regardless of frequency and size of float simply MUST study and adopt these Money Management principles. Without them, they stand to fail miserably or experience less success than they might otherwise have had. Pricing an intangle which encompasses life long learnings of a successful trader is difficult. I would pay double or even tripple the intended price of $97 if it was a first exposure to TSR. Even as a secondary exposure, such a price tag will be repayed over and over again for as long as we implement the teachings therein. I particularly liked the fully worked example which pulls all the individual learnings together and shows how powerful and necessary the entire process of money management is. I wish you every success with TSR2 and look forward to continued publications from you for years to come. I found this to be an excellent manual on the all important subject of money management. The costs that accompany trading are decribed and the trader must be prepared for losses - we all have them. In other words it is part of getting my phsycology right for what will be encountered. I thought the graphs and tables provided good illustration of the points being made and the examples completed it. The final excellent point following close on money management is the power of compounding - the secret of the 'get rich slowly' principle. I find your material very well written and a easy read. Regarding your "Top tip" in Chapter two, it was right on the button. "I want to make 200% a Year" is a wish, not a plan. In order to succed, you have to have a plan, a wish will not do the trick. You certainly gave us much valuable material in your e-book to really use in developing a trading plan, which will be very valuable in achieving one's goals. I certainly enjoy the parts about the average true range (which I use almost every day) and stop methods. If you would like to communicate with me at any time, drop me a email." It was a great pleasure to hear from you about TSR2.0. The original version was my true hearted companion through long trading hours. Without the Holy Grail introduced with TSR, it might not be possible for me to survive through the global crises. The money invested for it not only compensated for itself, but also saved my trading life probably. The bonus calculator really deserves sincerely compliments for its help for fast and easy position decisions. The trade log template was another treasure for the people who appreciate the value of the self-criticism about their own trading history. Thanks David for your invaluable efforts to create shoes for the running trader. "Have read the upgrade and am impressed with the lucid way you explain everything. Having completed Triple Your Trading Profits in April last year and have also read Stuart's book 'Trading in a Nutshell (earlier version), I didn't expect to learn much more but found the section on stop losses and trailing stops particularly useful. I prefer your 'let the profits run' system with trailing stops. Since reading TSR2 I ve tightened up my trading plan and am confident that I can curtail my frequent lapses of not acting promptly on stop losses. The proposed price is very reasonable. "I wish that this information, packaged as it is, would have been available years ago. It would have saved many hours of research time and eliminated a lot frustration to get to the point where you can start to enjoy some success. Thanks for a very usable and workable trading trading plan. " "Going through your TSR2.0 reminded me of rules that I used to abide by, not sure when and why I went off course, I think panic set in and I reacted without thinking and then ended up getting sidetracked and doing the opposite to what I should without realizing it. The Q & A are a fantastic idea - it is easy to see the areas that I know and understand and the areas of trading and money management that I need more training in. Thank you for TSR2.0 - reading through it and answering the questions has made me realize and admit to myself how far off track I had gone - now I know how to focus myself again. By the way, I have TSR2.0 in a folder on my desktop. Great job - thanks for giving me the opportunity to share your wisdom and knowledge"
To learn more about strategies and various indicators, read the Forex Indicator blog.